Shakes head slowly in disappointment! You’re telling me this now? When did that happen??? The morale of the story – Are Men simple or Women complicated??? I think it’s fair enough to say “both”!!! I honestly don’t see what the problem is for a man like me to start taking Salsa classes just to meet women to possibly date? I mean in my dance scene (Popping, House dancing, street dancing, etc.) it’s all guys. You can’t meet women when going to a session, battle, cypher, or workshop where it’s nothing but testosterone. Lets just say that I got into dancing as a whole to impress women but somewhere along the line, i got deep into ALL forms of dance and appreciate them for what it’s worth (case in point, i take Salsa lessons not only to meet women but to also see how I can combine them into my Popping and Houseing). 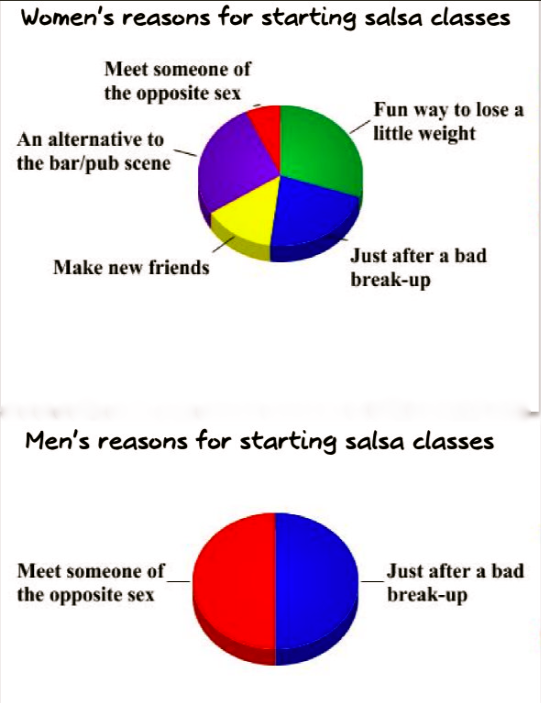 Does the Salsa/Latin Dance scene really hate guys like me? Honestly, I thought that women like a guy that can dance. The Salsa scene absolutely does NOT hate guys for starting dancing to meet girls. It’s really common. The diagram was just a bit of fun for everybody to laugh at because it’s common… but definitely not frowned upon. On another note, I think your idea for mixing salsa with popping etc. is an amazing idea. It all adds to the evolution of the dance. I hope you give Salsa a try.